If anyone is looking for RID combiners, TRU Doncaster has them. Scanning up at $60 each. Scouted Watergardens Shopping Centre this morning thinking I might find TLK Legion Megatron. Nothing. Only TLK Legions they had were Barricade and Grimlock in Target. No new TR Deluxes (Misfire, Slugslinger, etc) in any of the stores either, just some Twinfernos at Target. Scouted Watergardens Shopping Centre this morning thinking I might find TLK Legion Megatron. Nothing. Only TLK Legions they had were Barricade and Grimlock in Target. Did you try Woolworths? Chadstone Woolworths had a display (near the nuts, not the toy section) with a bunch of TLK Legions and One Steps - including Megatron, Drift and Crosshairs in the Legions. 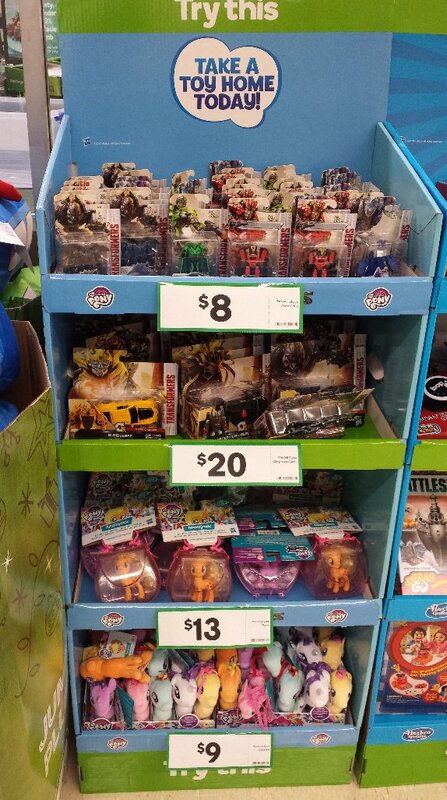 If you're still looking for a TR Hardhead or Quake, there's one of each at K-mart Chadstone. Thanks for the tip. I checked Woolworths at Watergardens too, but didn't see anything. I most probably looked in the wrong place (i.e. the usual toys/stationary section). Near the nuts you say? What an odd place for Transformers..
To be specific it was at the store's promo section where seasonal stuff ends up being, makes sense...christmas is 4 months away.